Pristine Oceanfront Paradise! - 2 Free Amenity Cards!! Watch the dolphins frolic and the shrimp boats sailing in the distance from our oceanfront - beachfront villa! We have just finished, as of Feb 2015, a major renovation project which includes a new state of the art Carrier Coastal Edition heating and air conditioning system, a new stainless steel refrigerator, oven, microwave, and dishwasher as well as 2 new flat screen TVs. Add to that a new ceiling and a fresh coat of paint from top to bottom and you're talking about heaven at the beach! And, for 2016 we have just added a new Serta Perfect Sleeper queen size mattress set to our oceanfront bedroom! Newhaven has just undergone a major renovation - new roofs, siding, beach access stairs and beautiful paint colors! Welcome to the beautiful, private island paradise known as Fripp Island. With three and one-half miles of pristine, unspoiled beaches that offer sand dollars, seashells, hermit crabs, and starfish galore, Fripp Island is the perfect place to leave your worries behind! This 3000 acre gated resort is host to such diverse wildlife as deer, herons, pelicans, osprey, egrets, alligators, and occasional loggerhead turtles. Fripp's stunning natural beauty is evident all around and it is obvious why Hollywood chose to film 'Forrest Gump,' 'The Jungle Book,' and 'The Prince of Tides' on Fripp Island! Besides its uncrowded beautiful beaches, the island hosts a unique variety of amenities. For the avid golfer, Fripp offers two exceptionally beautiful and challenging courses. One was designed by George Cobb and features spectacular oceanfront views (the 18th hole is located just steps away), while the other was designed by PGA champion Davis Love III. Fisherman can spend their time along the meandering tidal creeks catching abundant fish, shrimp, and blue crabs. For the shopper, there are numerous shops and boutiques on the island offering everything from casual wear and souvenirs to grocery items. Guests have a choice of 5 different restaurants on the island (The Ocean Point Grill is located across the lane). As our guests, 2 amenity membership cards are included in the price as are all taxes and cleaning fees - NO HIDDEN CHARGES! There are numerous swimming pools on the island (one of them heated year round) that overlook the ocean. One of these is just steps away! There are 8 soft and 2 hard surface tennis courts for your enjoyment as well as jogging, bike and roller blade trails, and scenic nature paths. You can also rent boats, jet skis, kayaks, golf carts, bikes, mopeds, or book a seat on one of the regularly scheduled excursion boats for dolphin watching, shelling, and exploring! Come stay in our charming, 1st floor villa complete with palm trees and stunning ocean views from both your bedroom and living room! Our condo was rated 'Excellent' by the Fripp Island Resort. The breakfast nook overlooks a beautifully landscaped courtyard featuring charcoal grills and tables surrounded by banana plants and hibiscus. Our villa features a large, comfortable living room and dining room area, a fully equipped kitchen with breakfast nook, a large bedroom with queen sized bed, bathroom, patio, and parking garage. It also has a fold down, queen sized Murphy bed in the living room. For the comfort of our guests, our unit is 'No Smoking' and 'No Pets'. Fripp Island is located just 25 minutes from historic Beaufort, 45 minutes from Hilton Head, one hour from Savannah, and one and one-half hours from Charleston for those of you who love horse drawn carriage tours, unique shopping, historic sightseeing, and all types of dining - from casual to elegant! Originally from Annapolis, MD we first visited Fripp Island after seeing the movie Forrest Gump and finding out that it was filmed here. We immediately fell in love with the pristine beauty of Fripp as well as the abundant wildlife that lives on the island and returned to buy a house several months later. We live here full time now and wake up everyday feeling like the luckiest couple alive! We bought our lovely condo on Fripp Island a couple of years after we bought our house here and have been renting it to visitors ever since. We now have lots of guests from all over the U.S. that continue to come back to Fripp and rent our condo year after year! The views of the Atlantic ocean from our condo are simply stunning and we still come over whenever there aren't any guests to just sit outside and watch the dolphins swimming around and the pelicans flying up and down the beach. Once you experience this you'll be hooked forever! Patio, Charcoal Grill (BBQ) No smoking inside unit please. Because this is a 1st floor unit and there is an elevator from the parking garage to the 1st floor, it is handicap accessible. This is our second time staying at your condo and we absolutely love everything about it! We hope to be back again soon. The views are great and the sitting area outside is close to the condo. Your condo is very cozy and has everything you could ever need. We had a very relaxing time! This was our first time on Fripp Island. We needed a break from the cold,snowy weather in Virginia. Oasis was a perfect place for the two of us. The kitchen was well stocked,though we mostly used the coffee maker and fridge. The couch and bed were very comfortable. We spent most of our time sitting in the rocking chairs wrapped in blankets, watching dolphins in the early morning, walking the beach, exploring the island and Beaufort. The beach access in front of the condo was not usable, the water was up past the first 5 steps. That was a surprise! (We think this was due to the time of year, the moon & tides). But it was a nice walk past the golf course to get to a nearby beach access. We did not get to meet Steven and Lynn in person, but our contact with Steven was very positive and helpful. We definitely recommend Oasis for an oceanfront getaway on Fripp Island! We really enjoyed exploring the Low Country of South Carolina! We're glad to hear that you and Ben had such a wonderful time staying at our condo and visiting Fripp Island for the first time. Fripp certainly is a pristine little slice of heaven! The tides were unusually high when you were here. Typically there will be a large beach right in front of our condo during the 2 low tides and not so much during the 2 high tides that happen each day. Although we live here on Fripp Island year 'round we never take it for granted and always feel so lucky to have found this place! Great view of ocean. Property excellent for short term stay. 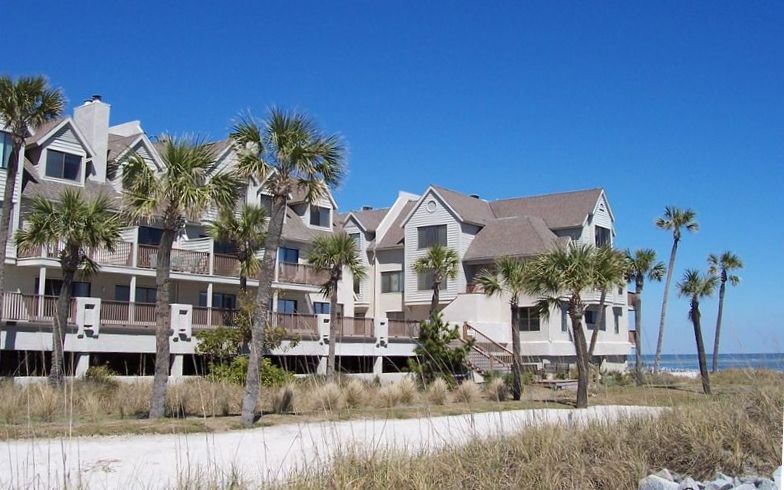 Glad to hear that you enjoyed your stay at our Fripp Island oceanfront condo! We know you traveled a long ways from Scotland to visit Fripp and would love to have you back again if you ever get the chance! Perfect place for a couple to get away. The ocean, palmettos, gulls and pelicans are all in plain view from the living room! Deer on the island appear to be as calm and tame as pets. Everything in the description is true. Steven and Lynn are as friendly and caring as any owner you'll find. Steven and Lynn, your condo is just as you say - pitch perfect. That view is priceless. It makes the stay seem even longer because you are always looking at the ocean. I could hardly sleep for just wanting to jump up and look out the window at it. The very comfy Murphy bed is a brilliant/convenient way to maximize space and worked great for us. Your condo is so charming, well-kept and well appointed. Our family loved the gazebo swings for read-outlouds at dawn and dusk. We saw dolphins as we walked the sandbar (just out our front door!) at low tide on our first day and they were not 30 feet from us. Loved being able to walk to the pool and beach in a few minutes. To cap off the whole magical week - we went to the beach at sunset and got to witness a loggerhead turtle nest inventory and watch five little guys who had not made it with their crew yet to the sea get a hearty send-off from the crowd rooting for them. I am already looking at your calendar for some weekends during the fall or winter and as well as next summer and have told many friends about you. It was such a lovely, effortless experience for all of us. Your condo, Oasis, is well-named and it was bonus to deal with such a lovely couple!